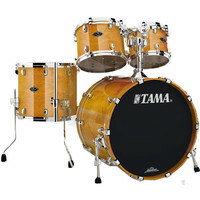 The Tama Starclassic Performer B/B shell pack was designed to offer drummers the rich sonic beauty of bubinga shells but at a more affordable price. The result is a marriage of bubinga and birch giving players an affordable but truly special drum kit. Featuring the precise attack of birch but also enjoying the rich low end of bubinga the Starclassic Performer BB is perfect for those seeking professional uncompromising tone without breaking the bank. Star-Cast tom mounting also ensures that the shells are isolated from hardware allowing them to resonate fully.